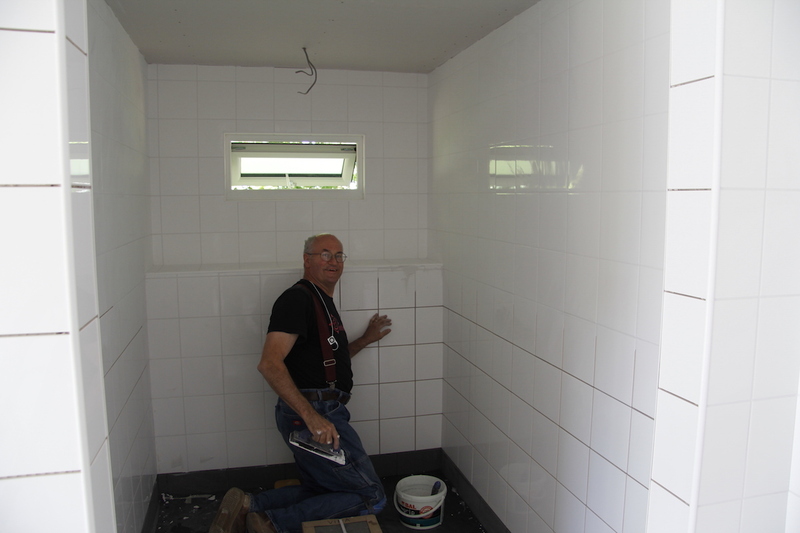 Harold, James’ step-dad, stayed with us for an extra two and a half weeks to finish tiling the toilet block. 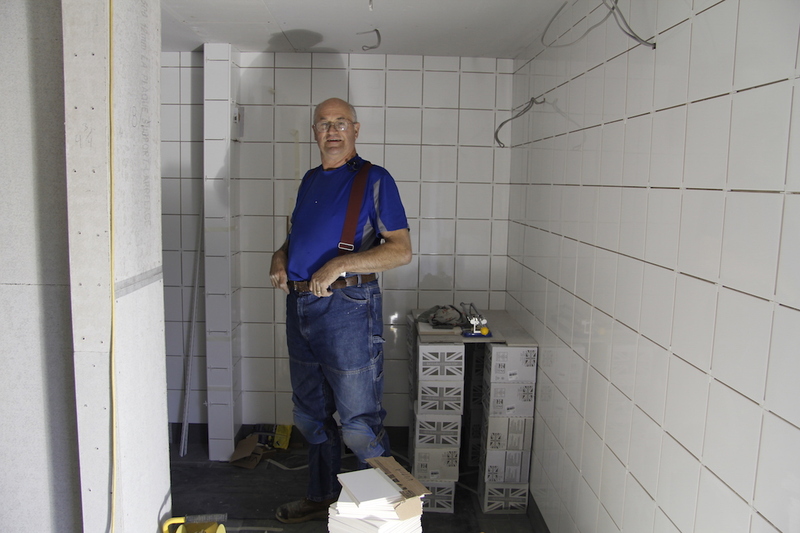 He and Kathy had already renovated the food truck – more on that later – and he had been working on our old toilet block and the new one as well – he is a superhero! Anyway ‘project-tile’ commenced. 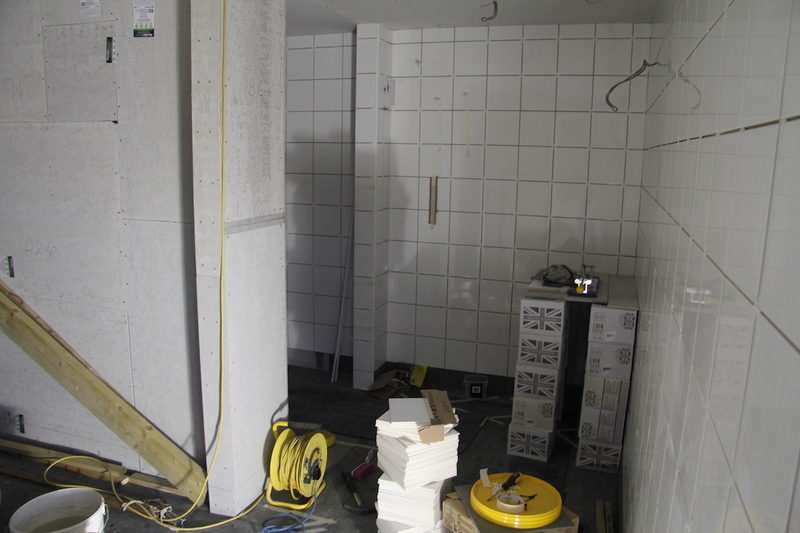 After laying the floor tiles down – see here) he started with the long straight wall. The toilet block became Harold’s office for two weeks while he undertook this massive task. He worked so hard – even working until midnight! 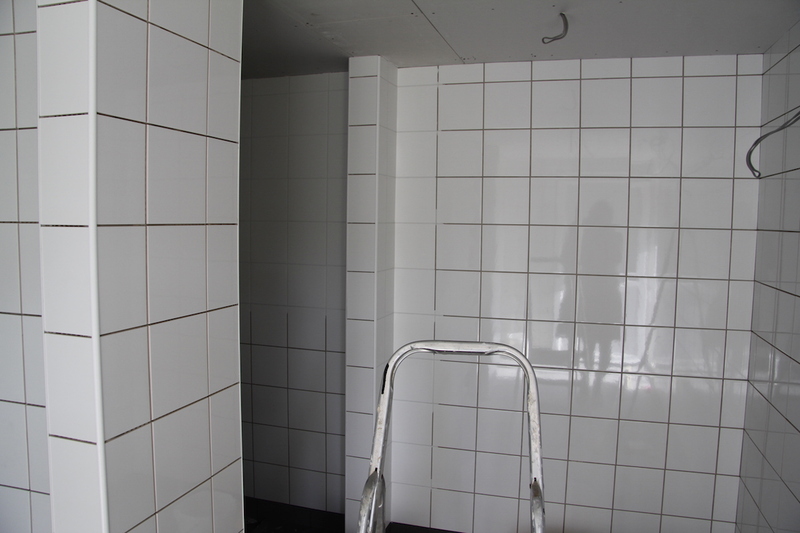 He did a meticulous and amazing job – I have never seen tiling as good. He not only made sure all the tiles were perfectly level (sometimes by grinding down the back edge of the tile) but he also cleverly thought of the pattern so that the lines in the toilets all look good. 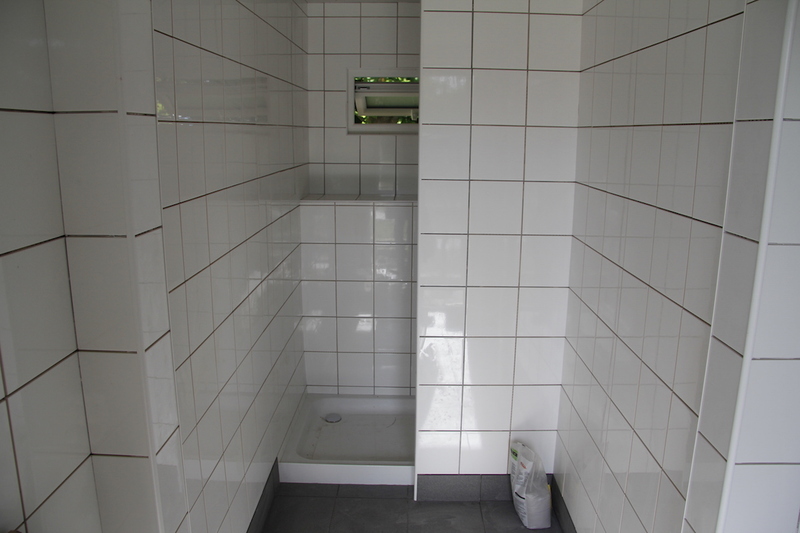 To be fair tiling the toilets and shower was not easy – there were insets round the window and the boxed in shelf/cupboard area that carries all the facilities, jut-outs for the door frames and the half wall in the shower. I went to the toilets in the Queen’s Gallery at Buckingham Palace – they are nice toilets (as you would expect), but they are no way as good as the toilets that Harold built. And I think we should put this on our advertising – such as we have any ….. our toilets are better than those at Buckingham Palace! Thank you so much for all your hard work Harold – we couldn’t have done it without you. N.B. We now have a name for our toilet block Harold’s Abode of Felicity. I am going to write it on a large tile in Ottoman for officially placing outside the block. Extra points for anyone who can guess why it is the abode of felicity – I have to say I find this as funny as calling our current male turkey Ataturkeyoglu – but that might just be me. Abode – that’s a dwelling place or home? Felicity – is it in reference to happiness/joy etc? Harold’s home of good cheer? But certainly NOT Harold’s palace! 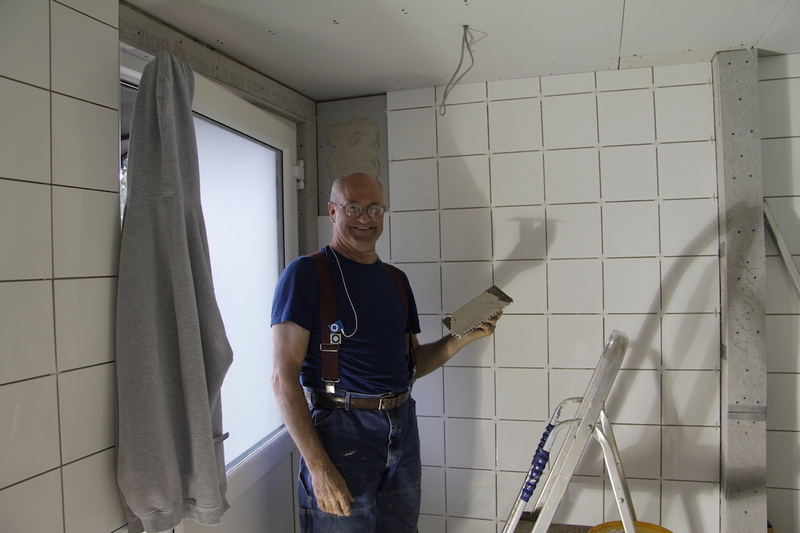 Harold is our super-hero tiler here in the U.S., too. Not to mention he has loads of other skills and just is a really lovely guy that we love a whole bunch. Do you know his nickname when we first met him was Happy? Some still call him by this name or the diminutive, Hap. Rather interesting you use this in the official name of the toilet block, eh?